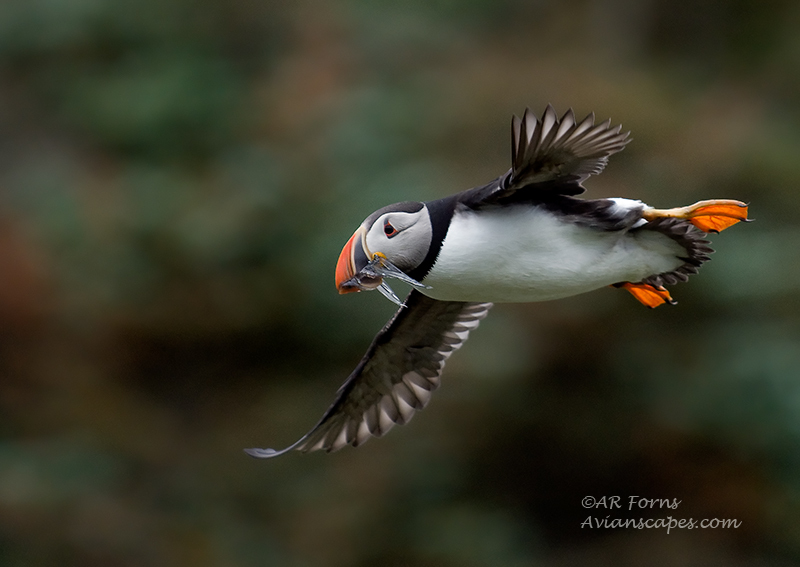 If you want to see and photograph Puffins, there’s no better place than Witless Bay, located in Newfoundland’s Avalon Peninsula, half an hour from St Johns. 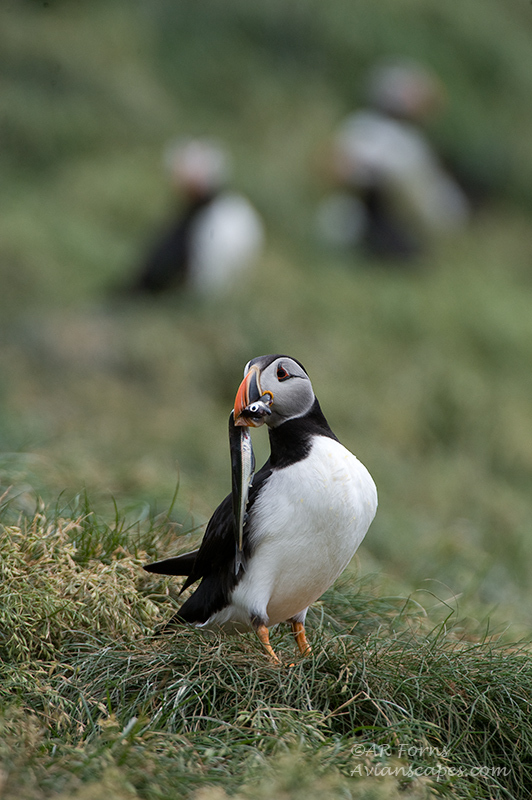 More than 260,000 pair of puffins make their homes in the area in late spring and summer. 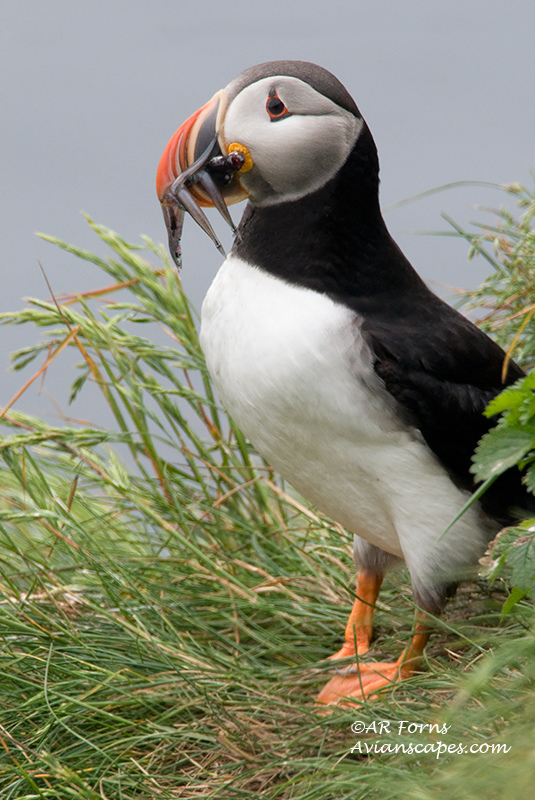 About 95% of all puffins in North America breed around the coasts of Newfoundland and Labrador. 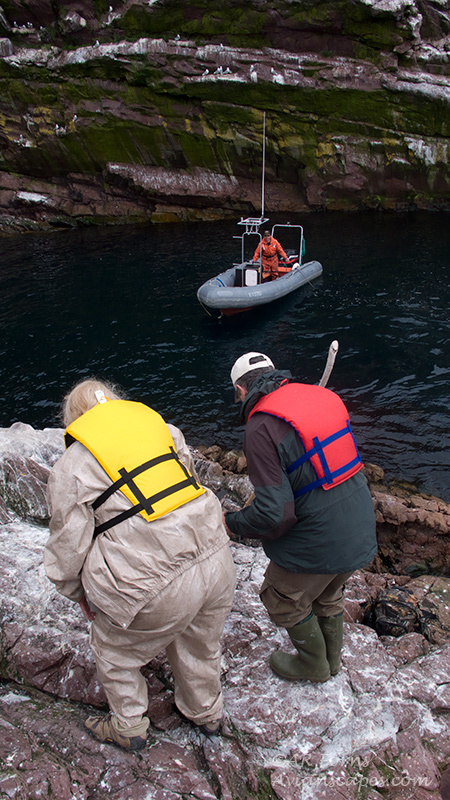 The primary destination around the area would be Gull Island, with restricted access,but can you get there with a tour operator and several are available in the area. 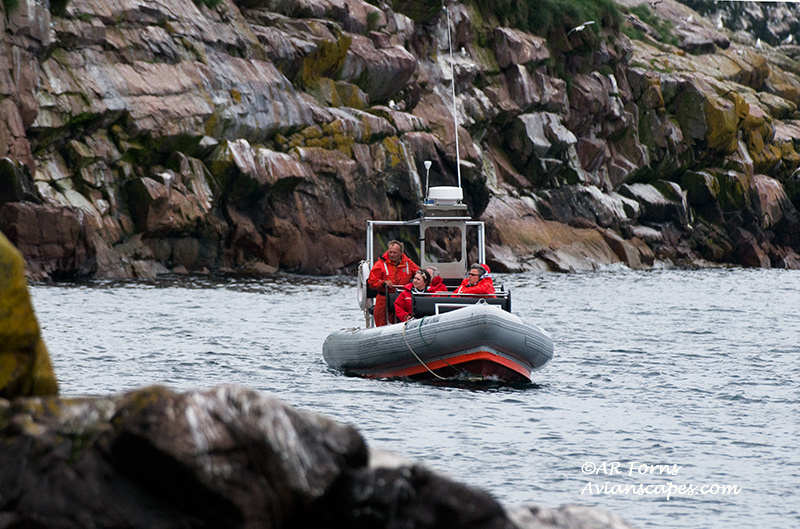 O’Brian’s Whale and Bird Tours operates a fairly large boat which will get you real close to the island. Real close … is comfortable and you will have a pleasant ride. 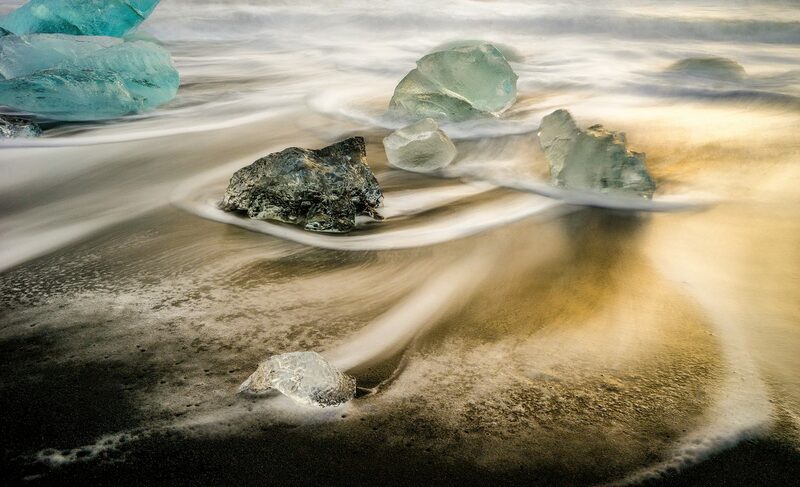 For photography, it will be tough since the boat is rocking and although a five hundred lens would be ideal, you will do much better with a shorter/lighter lens. A better alternative would be going out with a smaller Zodiac, which will be an adventure in itself. Elaine’s B&B has Zodiac tours both for groups and private, the latter would be my suggestion. If you would be staying for a few days would highly recommend staying at Elaine’s. One thing to keep in mind with the smaller boats is keeping your gear dry .. not easy !! 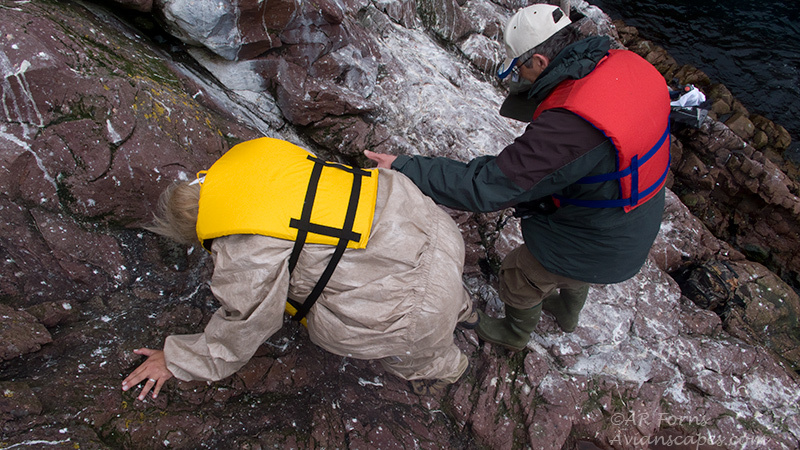 You need to use heavy duty protection like ThinkTank Hydrophobia. An even better alternative is obtaining a permit to actually land on the island for a couple of hours. This will take some doing and very few are given out. We managed to obtain a permit and it was a total sensory overload. You will have restrictions in needing a biologist to accompany you on the island and there are lots of places you will not be able to go. 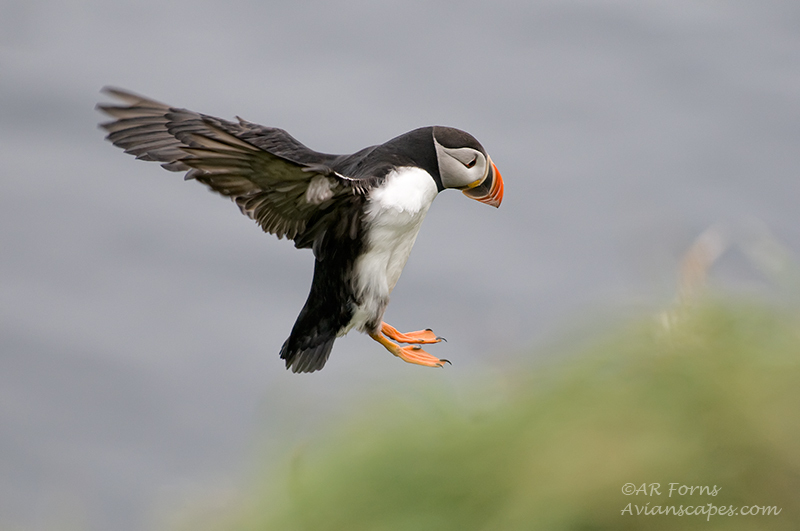 Walking over and destroying puffin nest is a strong possibility so you better do what you are told. Weather is always a problem so you will get a three day window for getting on to the island and once you get there you hope landing will be possible. There is no easy area to land, you just leap from the boat to rocks and hang on !!! Moving at first is difficult, since the going is steep and extreme caution is needed. After a successful landing you make your way up, first through colony of herring gulls which will attack you, so placing the tripod over hour head for protection is necessary. 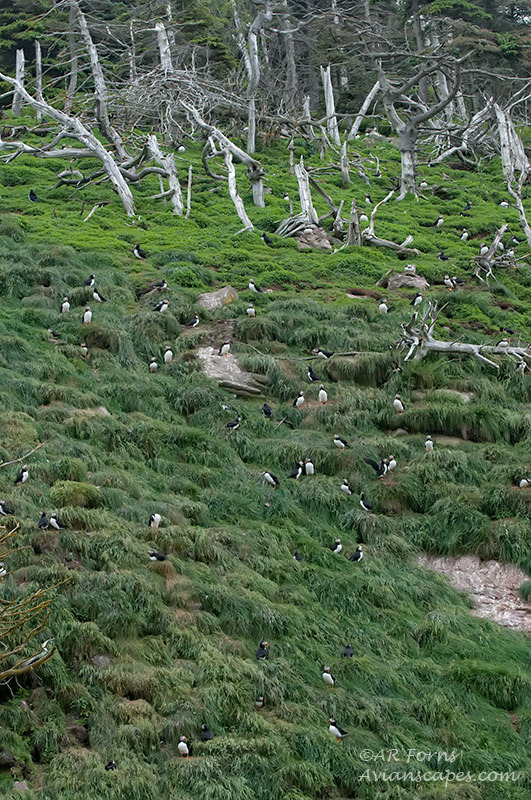 Once you reach the top and the puffin nesting area is pure joy to photograph. You will be within a few feet of the birds and don’t seem bothered at all. Your guide will move you around so you will not be by the same ground and allow them their usual routine. 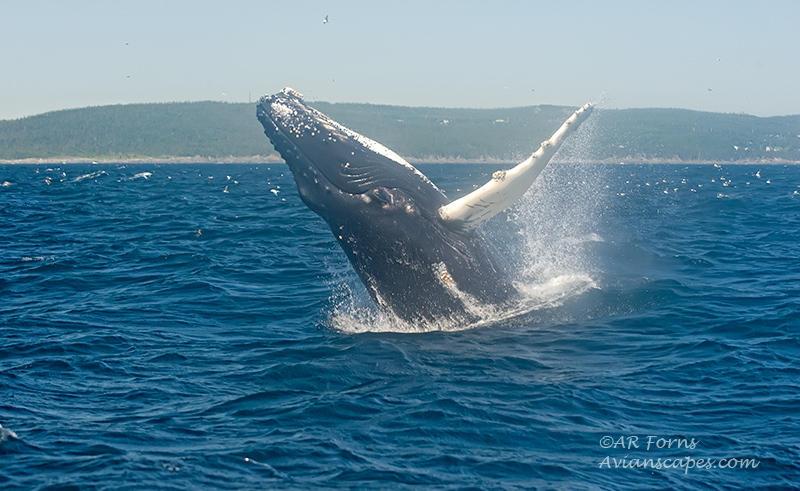 After leaving the island you might luck out and probably will, finding whales !! 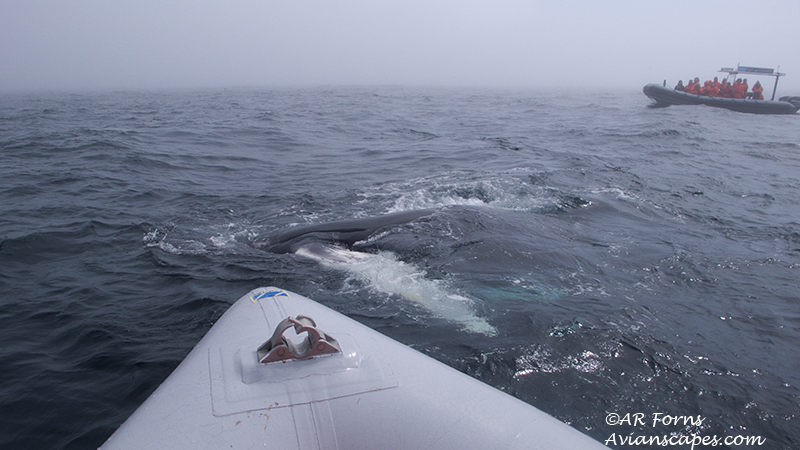 We had incredible action and even decided to return on the little zodiac the next day just to go whale watching. This is one of those destination which you will be making plans for a return trip while your returning home … we did !!! It looks like you guys had quite a trip! I have traveled to Labrador (Goose Bay) before courtesy of Uncle Sam. My trip wasn’t a pleasure trip though.